Amy at Hope is in the Word made the statement earlier this year that she heartily believed that Unbroken would go down as her favorite read of 2011. (Actually, she said it might be the best book she's ever read in her life. That's hard to beat, don'tcha think?!) I didn't even bother reading the rest of her review. I knew I didn't need to. I knew I would have to buy a copy of the book and read it for myself after such a recommendation by one of my favorite fellow book bloggers. So, I bought it. And then I sat on it for months and months and months and every time I mentioned it she would say something like, "WHY haven't you read it yet!" only kinder. 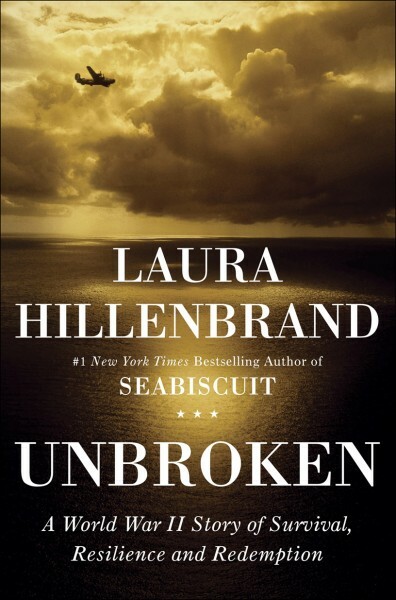 Suffice it to say, Unbroken is probably going down as one of my favorite reads in 2011 and if I lived next to you I'd probably stomp over to your house, remove all other books from the vicinity, and would demand that you read Unbroken next. Then, of course, you would do so just because you would. Go ahead. I'm waiting. You might as well accept the fact that I'm going to harp about this book until you do. This is my next Book Mission in life. Consider this fair warning. Now, I assumed going into this book that it was a novel. It is not. It is narrative history, a true "Story of Survival, Resilience, and Redemption" about a man named Louis Zamperini. Zamperini was an Olympic hopeful when World War II changed everything about his life, who he was, what he dreamed of, and who he ultimately became. Before you start thinking about how boring history is I'm going to stop you right there and repeat the phrase "narrative history." 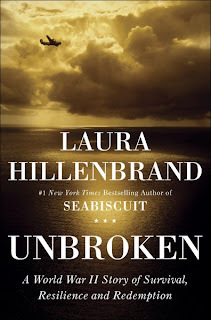 Laura Hillenbrand wrote the book in the same style as a novel. It looks like a novel, it feels like one, and it even sometimes tastes like one. Except it is all fact and no fiction which will boggle your mind as you read along. It is hard believe the story is true, but Hillenbrand offers up about 50 pages of notes at the very end of the book listing facts and figures. There are footnotes scattered about the book as well offering sources and additional information to help you understand the people, situations and, yes, the history all a little bit better. I learned more about B-24's than I ever though I could want to know. And when the B-29's rolled out I could have hit the roof cheering! Hillenbrand writes so very well that I actually cared about the makes and models of airplanes. That kind of writing takes talent, folks, and she's got it in spades! She draws the reader in all gentle-like and then stirs their soul, causing them to take on causes and care about the emotions of the past. She paints a picture of the horror of war that will make your blood run positively frigid cold. And then two paragraphs later, the American reader will be out hoisting the flag above their home. Unbroken is a phenomenal story. Yes, the book is also a difficult read and I'm going to warn you that the first 1/3 of the book might make you wander why on earth I'm recommending it. (I confess to maybe wondering about Amy just a little...) but you'll get to about the halfway point and bells will start going off in your brain. Then you'll complete it and then, well, I'll just reference you back to that bit about thanking me for the experience. It is a book about war so it is not going to be pretty. War isn't pretty. I like the fact that Hillenbrand spells that out for us. I didn't feel as if she were sadistically torturing her reader with unnecessary facts but, rather, she was teaching the reader (subtly!) to be extremely grateful for the past so that we will know what to value in the future. Hillenbrand gave us history that we can be proud of, grateful for and can stand to learn a thing or two from. Most of all, she breeds gratefulness for all that we've been given as a nation, which comes from all of the places our nation has been. My one and only regret in reading this book is that my dad isn't around to pass it along to. This is one of those perfect reading experiences that you want to share with the person who you know it will mean a great deal to. My dad would absolutely be enthralled by this book and I would love to share and snicker over certain passages with him. Alas, I cannot do that. My consolation in the grief is that one day he'll get to hear this story for himself. What a thrilling story it is to tell and to hear. So why, exactly, are you still sitting here? Well, I guess another one to put on my list! Off to the library site to see if they have it. Loved this story! I listened to the book on audio, and it was amazing. I'm so glad you finally read it!! Isn't the store absolutely breathtaking? It is my fave read of 2011, too. Guess what? My parents are going to a church in a neighboring town this week to see and hear Louis Zamperini in person!! OK, I'm going to try again. I tried it after Amy recommended it - only got about 20 pages in and wondered what was so great about it. I passed it to my husband, who had heard my opinion on it so he passed on it as well. You've convinced me that I have to try again. I've never disliked a book that both you and Amy recommend. I'm going to reserve it at the library again right now. Well done, Carrie! :-). I must say that I'm really relieved that you loved it as much as I. And I loved making a cameo appearance in this review! ;-). A. I'm a former history major and most of what I read is history. B. I am a closet (or not so closet) sports history fanatic. C. I openly LOVE WWII history. This sounds like the book for me. Best book ever. Or, at least this year! I even used it a talk I gave at church. Oh my, Carrie's on the rampage again. Yes, see people? I'm not alone. And I also feel like I'm already accomplishing my mission. Insta-success! I read this book earlier in the year and loved it! I, however, enjoy novels, fictional or not, about war. I always tend to learn so much and having a Marine for a husband, when I get stumped on something I may not understand, I ask him for clarification! This novel is still one I think about often and am constantly recommending to people when they are looking for something amazing ro read! Yes, just read this one earlier this year! I loved it so much. Couldn't have asked for a better ending if it had been fiction. I was kind of annoying after I read it, making sure all of my reading friends and family had read it too! I've read nothing but glowing reviews of this book. I'm definitely going to have to get my hands on a copy. I've linked to your review on War Through the Generations. I bought this book and Sarah's Key by Tatiana de Rosnay a few months ago.I've been sick with a cold and finaly had time to lay in bed and read.I read Sarah's Key first.I think I'll get off the computer now and go read Unbroken.I love your wonderful reviews.